Three ways to prevent falls in the house. There are certain areas in the home where seniors need a little extra support, like in the bathroom or on stairs. To keep your clients safe, make sure sturdy railings are installed along either side of any stairways in the home. 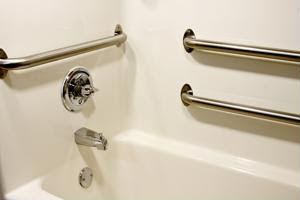 Your clients' bathrooms should have grab bars near the shower and toilet that they can hold onto while climbing in and out of the shower or bathtub and standing up after using the toilet. Common trip hazards found in many homes include area rugs, power cords and general clutter, so work with your client to remove any of these from pathways. Area rugs can either be secured using double-sided tape or removed completely, and power cords should be secured against walls. Poor vision is one of the most common reasons seniors trip and fall, so making sure all of the rooms in your clients' houses are well-lit is a must. Add lamps when needed, and try to keep curtains and blinds open during the day.